Like an NFL receiver who makes a difficult catch and then gets hit high and low simultaneously, Sarah Palin wins the Republican Party’s game ball. Although accomplishing what no other Republican candidate for national office has in modern times, the Alaska governor was snarled at, mocked, condescended and socially snubbed by pretentious Manhattan and Washington Beltway insiders for not being one of them, for getting too close to the common herd of regular Americans.Read this fine article here. Thanks to our friend at Goodtime Politics for making us aware of this article. Thanks to Chrissie over at Theodore’s World for e-mailing me this link. Piper is so cute in this clip. Let’s make it happen, and get behind Governor Palin for President in 2012. Alaskans have argued for generations over the location of the state capital, about access and power and the weather in Juneau. But in just two years, and with hardly any debate, Gov. Sarah Palin has shifted the center of state government to Anchorage. Read the story here. Thanks to our friend Jack for bringing this to us. Thanks Jack, Bob A. Once again Governor Palin shows that she does not follow the establishment, does not follow the pack. This is the person we need leading this country. Not Obama who is only transferring the dirty Chicago style politics to Washington DC only increasing the stench of unsavory politicians. Get behind Sarah Palin for president in 2012. Published on Monday, December 15, 2008 10:25 PM AKST Given current national circumstances, watching voters turn away from the kind of leader we so desperately need is as sobering an event as the Alaska winter must be. Nevertheless, you ran an electrifying campaign under restrained and difficult circumstances. While your running mate garnered his comeuppance, you’ve energized conservatives throughout this land. There are tens of millions of Palinites out here very eager to do something. Ominously, this election demonstrated that the Democrat machine has come to mimic the old U.S.S.R., in that it now reserves unto itself the right to lie, to cheat and to commit any act to further its own ends. Democrat tactics were on full display this time: American electoral probity be darned. There was voter registration fraud, ballot fraud, bureaucratic corruption, media malfeasance and ballot-count manipulation. They likely took millions in illegal donations, talked the economy downward and fiddled with the stock market too. It was a perfect feast of “coincidences” for them. While most Democrats are misguided, some are plainly evil. Democrats and too many Republicans are now running this train on the same track in the same direction, which makes any operational differences inconsequential and moot. Liberalism would have nothing to plunder if conservatism did not build it first. It’s past time for prudent conservatives to get real. Read the entire letter. Source. I ran across this posted at our friends at Good Time Politics. It is from the Mat-Su Valley Frontiersman. There is a link in my blogroll. Let’s get behind Governor Sarah Palin. Help get the word out. The media will not do it, they still seem hell bent on destroying her. Former Republican vice presidential candidate Sarah Palin said she would refuse a $25,000 pay raise during her current term as Alaska governor. A state commission recommended boosting the governor’s pay to $150,000 from $125,000. The five-member state Officers Compensation Commission, created by the state Legislature, also said legislators needed more money, along with the lieutenant governor and government department heads, the Anchorage Daily News reported. If the commission pushes ahead with a pay raise, Palin will not accept the money, spokesman Bill McAllister said. “Her view is, it’s just not appropriate to accept a pay raise in the middle of the term,” he told the newspaper. Palin’s term ends in 2010. Palin makes 46 percent more than her most recent predecessor, Frank Murkowski, but is the 24th-lowest paid governor, the commission said. 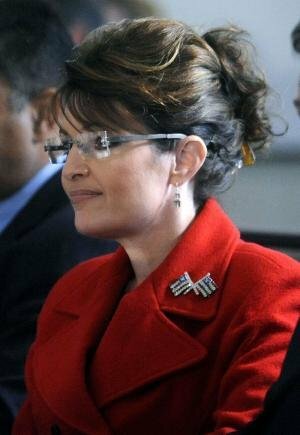 Palin 2012……..Change We Will Be Begging For! Contrasting this to the various and sundry silverspooners like Kennedy and Pelosi as they gobble up every Congressional pay raise like clockwork. California should take a page from her book. Michigan too! No comment, ecept where is the main stream media and so caled “reporters”? Deafining in their silence . Visit our friend at Theodores World, that gave us this post. Once again Governor Sarah Palin is shining like a bright star in an otherwise dismal world of self centered politicians. Where is the main stream press on this. Deafining in their silence as usual. We let the opportunity to see Governor Sarah Palin in the White House in 2008 as Vice President but must not let 2012 slip by without seeing her there as President. Help get the word out that she was, is and will be the best choice. She should have been let lose by the McCain campaign to go as Sarah Palin. She should have been campaigning in jeans and a flannel shirt. The media also had a strong bias for Obama and against Governor Palin. Gov. Sarah Palin has indicated she’s open to a presidential run in 2012, but her spokesman said Wednesday she has never stated she would first seek the Senate seat held by fellow Republican Lisa Murkowski. “I have never heard it come up. More than that, I’m unaware of why we’re even talking about this,” spokesman Bill McAllister said. He was referring to comments made by Murkowski that Palin would have a hard campaign beating her, an incumbent with rising seniority in the Senate. “I can guarantee it would be a very tough election,” Murkowski said in an interview published this week on Politico.com. Murkowski was appointed in 2002 by her father, Frank Murkowski, who held the Senate seat for more than two decades before he was elected governor. She will become Alaska’s senior senator after the recent loss by Ted Stevens, the Senate’s longest serving Republican ever. This is good news for the American People and the Republican Party that Governor Palin says she is open to a presidential run in 2012. It is time to start working now, not tomorrow.